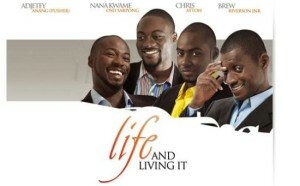 This film follows the intertwined lives of four male friends. Each man faces unique problems as he tries to achieve his goals, find love, and maintain strong friendships. Ultimately, these friends must learn to deal with, and embrace, the challenges of adulthood. Major themes include love, friendship, and family. Challenging the Status Quo: A Feminist Reading of Shirley Frimpong-Manso’s Life and Living It by Kwansah-Aidoo, Kwamena, and Joyce Osei Owusu. Feminist Africa 16 African Feminist Engagements with Film: 53. African Video Movies and Global Desires: A Ghanaian History by Carmela Garritano. Athens, OH: Ohio University Press, 2013. Project MUSE. Web. 13 Apr. 2014. <http://muse.jhu.edu/>.